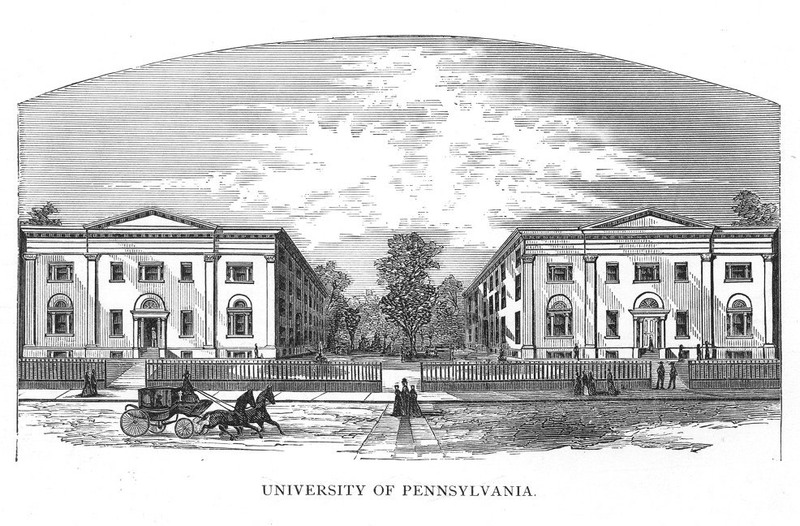 In 1830 the campus of the University of Pennsylvania consists of two large Greek Revival buildings on Ninth Street between Chestnut and Market Streets. Prior to that year, there had been just one building on this spot — the University’s only building — a public residence built for the President of the United States in the late 1790s when the Commonwealth of Pennsylvania was trying to convince the federal government to remain in Philadelphia. This great mansion had housed both the College and the Medical departments from 1802 until 1829. 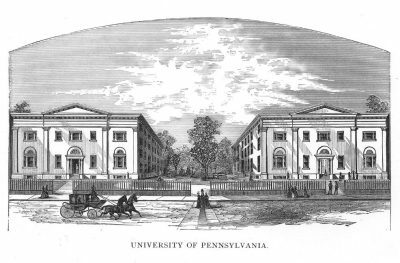 At that time, the President’s House was torn down and replaced by the two new buildings, one for each of Penn’s two departments. In the collegiate department there are approximately 20 students per class and five faculty members, including Reverend Dr. William Heathcote DeLancey, Professor and Provost since 1828, who is the leader of the University, academic and otherwise. The Penn community is a small, tightly-knit group; most of our students and faculty members are Philadelphian Episcopalians and many of our students join the ministry. Most of this Web site is about this collegiate division, even though it’s the smaller of the two departments of the University. The other department — the medical department — is much larger and more powerful than the college. The first medical school in the nation and still the most prestigious, the medical department has hundreds of students enrolled in it, over half of whom are from the south and all over the United States. The classes are all small and intimate and personal attention is guaranteed; all the students in each class take the same courses of study. Students have to study Spanish, French, or German, however, if their parents demand it. This is one way in which Penn stands out from our contemporaries, who largely offer only the traditional Latin, Greek, and Hebrew. In teaching modern languages, Penn thus teaches practical skills, as its founder, Benjamin Franklin, wanted his Academy to do. Although there are no electives or majors in the coursework, there is a classically and scientifically-oriented curriculum. The courseload includes Rhetoric, Algebra, and Horace, for freshmen, and Cicero, the Iliad, Elocution, Trigonometry, and Chemistry for sophomores. Juniors study Juvenal, Calculus, Moral Philosophy, Electro-magnetism and more, and seniors Physics, Geology, Tacitus, and other courses including one titled, “Evidences of Natural and Revealed Religion.” We also have suggested reading lists for the students’ spare time. The tuition at Penn is relatively affordable: only $25 per term, “payable in advance,” although this doesn’t include the extra $3/week for room and board. 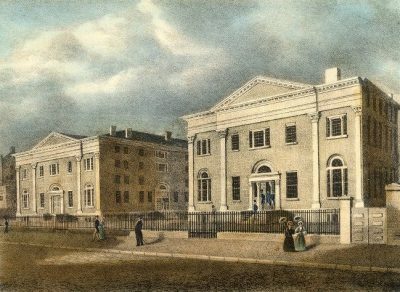 For undergraduates much of the intellectual life on campus centered around the young Philomathean Society, founded in 1813. Members of “Philo” publicly debate each other on ethical, theoretical and practical issues, such as slavery, temperance, economics. They also give public orations and Philo even maintains its own library in the northeast corner of the new College Hall. A second, similar society, the Zelosophic Society, was formed in May 1829 by seven juniors and the new, young, and popular Professor Coppee.